Side view of rebuilt A-508, April 2002. The MX636s are really big ones that can be seen in heavy freight and in the past years during the summer time in passenger service (they have electrical train heating that interfers with the signalling system). Ten units were put in service in 1975 as the last locomotives for the Hellenic Railways from overseas. 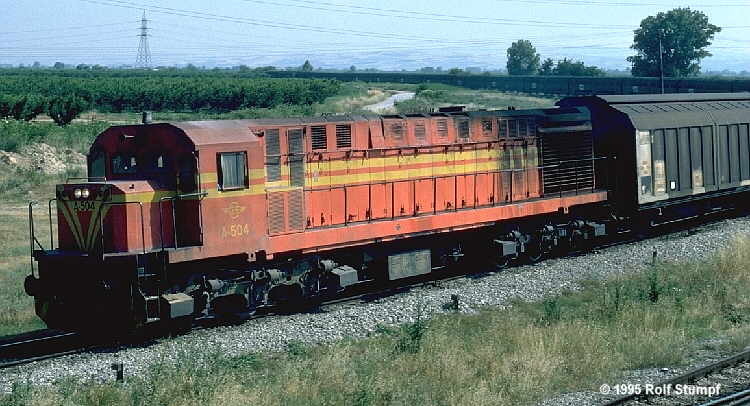 They were at their time the biggest and strongest locomotives in Greece, until ALCo 251-powered diesels came from Romania in 1982 (see A-551 class). Those end cab units are a bit longer and develop 4000 HP. Two wrecked MX636 are stored at Athens Aghios Ioannis, A-505 is completely stripped for parts, A-502 not looking much better. Since the retirement of the A-551 class in July 98 the MX636 are again the biggest blocks in Greece... 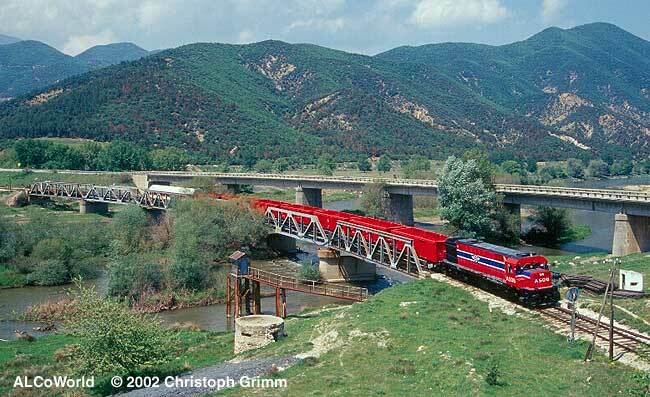 Most action takes place in and out of Thessaloniki on the Athens, Kozani and Alex lines - mostly freight now. Despite the working caternary they still show up on the Idomeni line to Macedonia. Two units (A-503 and A-510) have had their ETH equipment made operational in late 98, and they have seen occasional use from Thessaloniki to Idomeni and Alexandroupoulis! However, during recent tests it was found that the power used for ETH was greater than expected, and they will not be used with this now. In late August 2000 A-504 was sent by ship to USA for a rebuild project. The remaining seven MX636 are to be rebuilt in Greece after the successful surgery on A-504. Meanwhile A-504 returned fully rebuilt. So far A-501 and A-508 have been rebuilt in the same kind at OSE's Lefkas shops. A-508 with a freight near Strimon, April 2002. 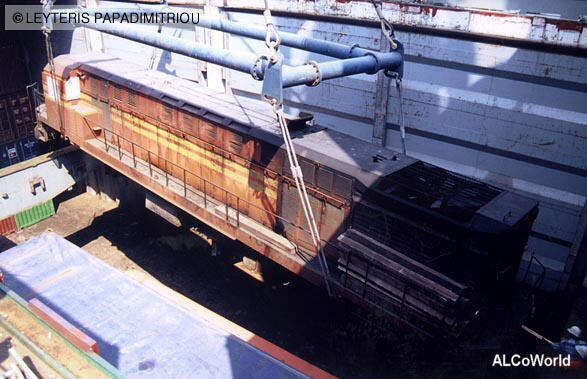 This is how the exodus of a Greek MX-636 began: A-504 is lowered into the ship at Eleusina port, August 26th, 2000. 3600 HP A-504 leads a freight to Thessaloniki, here caught from the (now razed) tower of Plati, a couple of kms west of Thessaloniki, June 22th, 1995.